Customize your medal below and press the "Make the medal!" button. 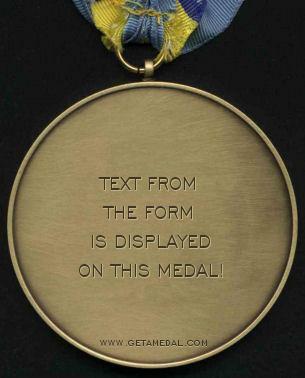 Your custom medal will be shown containing the text that you entered. What should you put in your custom medal? Congratulate someone (maybe yourself) for a job well done. Give someone a funny medal for something they've never done. It's up to you! The only limit is your imagination. The custom medal maker uses capital letters on the medal, even if you enter lower case letters. If you enter capital letters in the form, they will also be shown as capitals, but they will be bigger. Put your message on the wedding chapel sign! Make a custom wedding sign!